^ Davidson, Eugene. The Making of Adolf Hitler: The Birth and Rise of Nazism. University of Missouri Press. : 241. ^ Orlow, Dietrich. 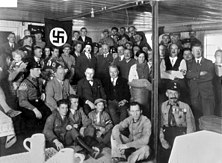 The Nazi Party 1919–1945: A Complete History. Enigma Books. : 29.